Fitting a contact lens on an eye creates an interaction between a ‘foreign’ body and human tissue. Corneal lenses interact with the epithelial tissue, and soft contact lenses interact with the epithelial and conjunctival tissues. In general, this interaction can be observed from several perspectives. Wearers will express subjective factors such as comfort and feeling. Eye care professionals (ECPs) will discuss fitting characteristics such as centration, movement, and edge interaction of the soft lens fitting. Using a mechanical approach, we may be able to bring those perspectives closer together. In other words, bring the subjective ‘feeling’ of the wearer and the objective observation of the ECP together. The interaction between a lens and human tissue can result in deformation of this tissue. Deformations can be elastic, visco-elastic or plastic. 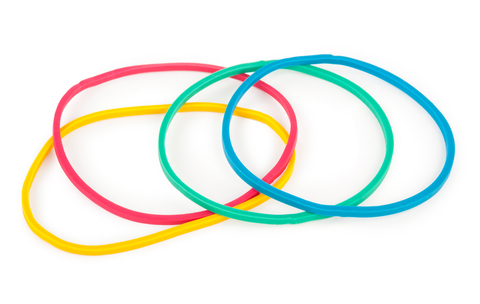 Whereas an elastic body returns to its initial shape after the force is removed (like a simple elastic band), a visco-elastic substance returns to its initial shape based on a time-dependent factor (like viscosity of ‘thick’ fluids). In the case of a plastic deformation, the shape is permanently changed and will not return to its initial shape after the force is removed. Newton’s laws of physics help us understand the interaction of two bodies and that equilibrium is related to the total amount of forces acting on both bodies. There is equilibrium when a contact lens is on the eye - the lens does not move in open-eye conditions and without lid interaction. The shape of a soft lens on eye is different from its shape on your finger. This difference in shape (strain) is caused by the interaction of lens and eye. The elastic body of the lens is forced to change as a result of the fit. The total force to change the shape of the lens is equal to the total force exerted on the eye, which results in a shape change to the eye as well. The forces are small, and the tissue is soft; therefore, the shape changes of the eye are only superficial and only in the upper layers such as the epithelium and the conjunctiva. A number of factors make lens fitting complex. The mechanical properties of human tissue are not simple elastic but are complex viscoelastic. Moreover, human tissue is structured in layers that have different properties, and there are differences from human to human and with age, gender, and health condition. The interaction of lens and eye is predominantly controlled by the fluid, capillary forces of the tears. But tears are a complex, viscous fluid and difficult to predict. On the other hand we have the soft contact lens, which has a complex, 3-dimensional, multi-curve shape and contains a substantial amount of water. The material is defined in part by its modulus, which is a measure of its softness. The force is equal to the modulus times the deformation. Lenses are fit on an undeformed ocular surface, but their resulting interaction deforms both the ocular surface and the lens. This deformation is limited for RGP lenses, but in soft lenses the deformation is noticeable. In either case, there is a mechanical equilibrium between the lens and eye. A mechanical approach based on equilibrium sets up a model that takes into account several mechanical properties to estimate the interaction. Although certain assumptions are needed, the results of the model simulations help with understanding the complex reality. Figure 1: Simulation of a soft lens fitting on eye. The contour line is the initial lens shape. The eye is assumed to be solid and rigid. After fitting, the lens is deformed. The color represent the local stress in the material. Mechanical equilibrium calculations are performed with the so-called Finite Element Method or Analysis (FEM/FEA). The objects are divided into a finite number of elements from which the equilibrium is mathematically calculated. Each element is in equilibrium with all of its neighbours and consequently with its boundaries. The properties of each element are those of the materials to model. For soft lenses, the most important parameter is the modulus followed by the shape, or the overall geometry of the lens. 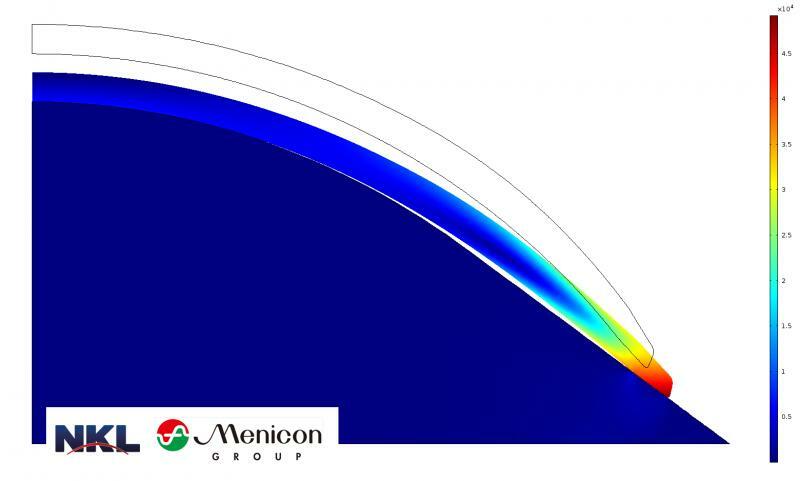 The FEA simulations provide the final lens shape in which all local deformations and local stresses are illustrated. This method of modelling can provide information on the effects of different geometrical choices in the design. This effect of local thickness or different thickness profiles on the shape is expressed in the stress in the material. 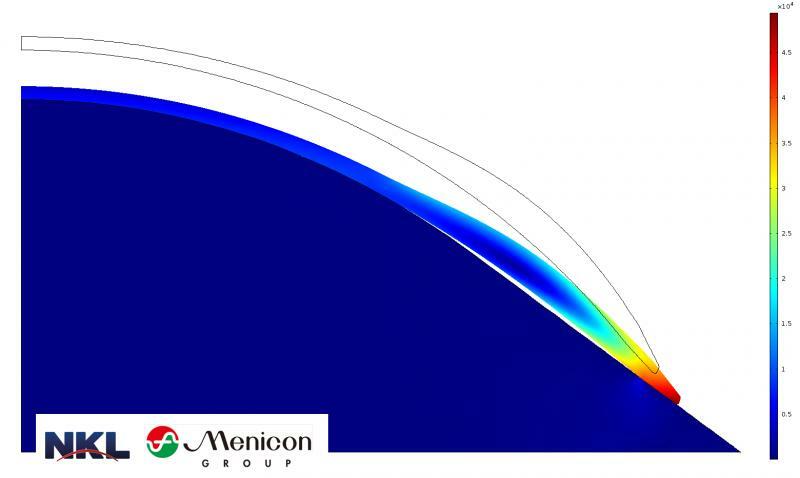 Figure 1 shows the simulation of the deformation of a soft lens. The initial lens shape is shown as a contour line. Fitting the lens on the eye applies pressure on the lens. The eye is represented as a solid geometry (having extremely high modulus) with the shape of an eye. The color gradient represent the local stress in the lens material. Although the figure shows a 2-dimensional representation of the lens, all 3 dimensions are used for the calculations. Due to the rotationally symmetric model, each cross-section can be represented. Several things can be noted. The stress in the center of the lens is zero (0), because it is the rotationally symmetric center of the lens. There is no noticeable stress in the optical zone because of the alignment fit. In the lens periphery, the stress increases outwards. The lens diameter is increased compared to the initial shape. The stress is clearly highest at the lens edge. Figure 2: Simulation of same lens as Figure 1, except the periphery of the lens is doubled in thickness. The result is a less optimal fit based on the wider gap between lens and eye. The same simulation settings are used for the third case except that the overall thickness of the lens is doubled. The lens back-surface geometry is identical to the two previous simulations, and no other changes are made in the applied pressure on the lens. The result is that the fit is less optimal compared to the other two as can be seen by the increased gap between the lens and eye (Figure 3). Understanding the deformations that occur in the complex shape of a contact lens when it is placed on an eye allows the lens to be designed to fit optimally. Modelling helps in this process. 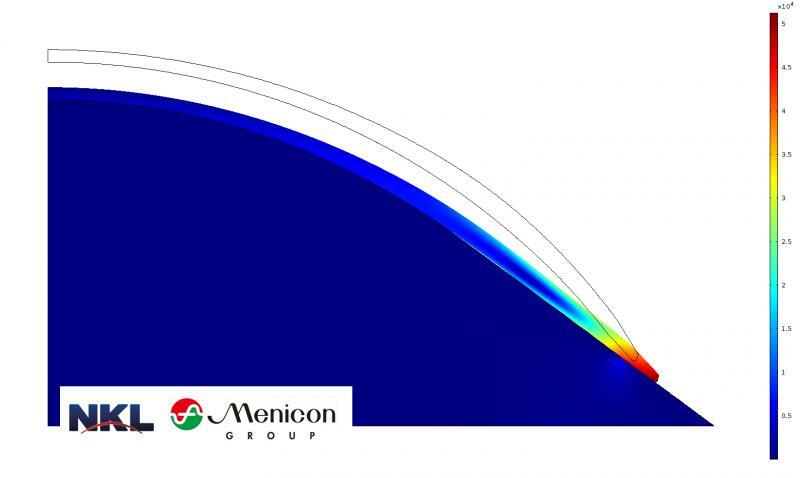 The sample simulations show that changing the thickness profile influences the fitting characteristics. The lens back-surface geometry must be adapted to create an optimal fit for a lens with a different thickness (profile). This mechanical approach to lens fitting reveals and will reveal more details of the interaction of a soft lens on eye. Such details help us design lenses such that the interaction is limited but sufficient for a stable fit. The lens design is linked with the material and its properties. When the material properties are different, the design must be changed to achieve the same fitting result. This approach helps contact lens fitters choose the parameters of each lens design to achieve the most optimal fit for each eye. Consequently, knowing the shape of the eye in more detail is essential to have more control over the interaction between lens and eye. Lens specifications such as lens height (CL-SAG) help with matching the ocular height (OC-SAG). This match is the subtle difference in height between lens and eye (Delta-SAG) that allows lens fitters to control the amount of interaction between lens and eye. 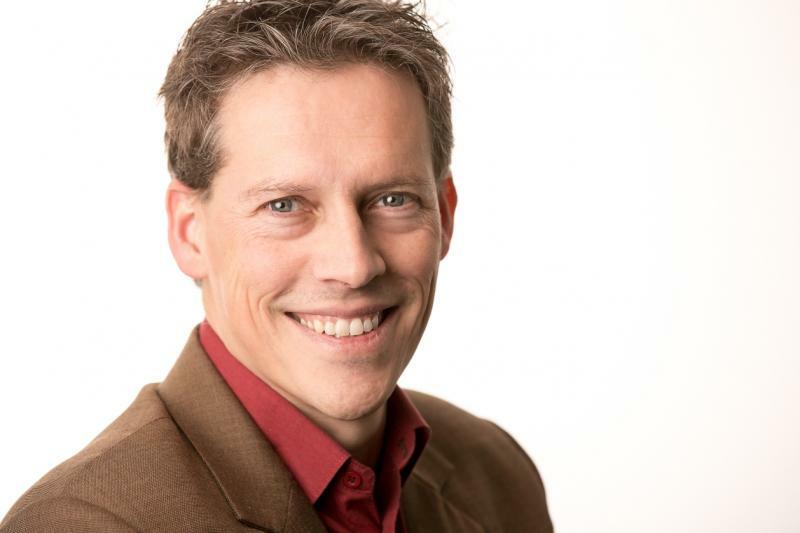 Bart van der Linden MSc PhD is technical Managing Director of NKL Contactlenzen, a Menicon Group company in Emmen, the Netherlands. He has a background in biomedical and mechanical engineering. At the facility in Emmen, made-to-order rigid and soft speciality lenses are developed and produced. He joined NKL after completing his PhD in 1998 as lead engineer on product, process and software development. He developed a number of lens designs that are widely available, and he developed the Easyfit fitting software. This software assists contact lens fitters with selecting and fitting the most optimal lens for each individual eye.